Consumer confidence in the U.S. economy is strong, bolstered by stable gasoline prices. That bodes well for beef consumption. Last week’s Industry At A Glance focused on the current state of the consumer. The Consumer Sentiment Index currently stands at 93 – somewhat lower than stronger numbers posted earlier in the year. However, the 12-month moving average is encroaching on 95 – the best mark for the average since early 2005. There are any number of reasons for continued strength on the consumer side, or at least consumer perception of the economy. Perhaps one of the most important components has been an extended streak of stability around gasoline prices. The energy complex has proven to be incredibly productive in recent years. Related: 6 Trending Headlines: CME to address market volatility, PLUS: Will oil prices stay low? 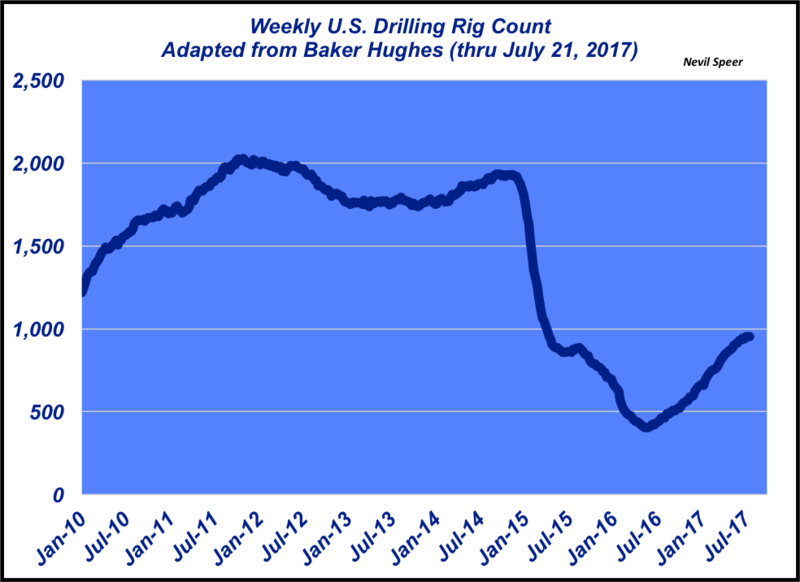 To that end, this week’s illustration highlights weekly drilling rig count in the United States. The current count stands at 952. That’s way off from the nearly 2,000 rigs at work in the peak of oil and gas exploration, but up sharply versus just a year ago. The energy industry’s success – and subsequent decline in oil and gas prices – forced the rig count plunge during 2015. However, the energy complex has begun to recover and is seemingly going back to work. That’s reassuring from the long view – it ensures there’ll be steady supply in the years to come. And that count doesn’t include active wells that are currently on pause until prices recover to higher levels. Energy is a huge part of our economy and largely impacts consumer sentiment. To that end, John Eichberger, vice president, motor fuels with the National Association of Convenience Stores, several years ago explained the effect of rising fuel prices this way: “…for the consumer it’s emotional, not necessarily a logical purchase. They go to extraordinary measures [to avoid higher prices].” Higher – and volatile – gas prices soften confidence and thereby impact consumer spending throughout the economy. And obviously, lower prices work in an opposite and favorable manner. It appears that the current price environment has bolstered consumers – and that’s likely helped beef demand during the first half of 2017. Moreover, stability around fuel prices also benefits beef producers in terms of budgeting – not to overlook the fact that lower prices also mean lower costs when operating machinery including trucks, tractors, steam flakers, etc. What’s your take on the energy sector? Where do you see fuel prices headed in the coming months? How have favorable fuel prices impacted your operation? What impact do you think the energy boom has had on our economy and the consumer? Leave your thoughts in the comment section below.